I traveled to Singapore in late June for the first time in two years. In addition to famous tourist areas, I went around spots I have never been to before this time. While I have lived in Singapore for a year and half before, I find something new whenever I revisit Singapore. In this article, I will write about Marina Barrage as part of Day 4. * Day 4: Marina Bay Sands etc. Following the previous post, I walked from “Supertree Grove” for about 10 minutes and arrived at “Satay by the Bay”. “Satay by the Bay” is a hawker center located in the east end of “Gardens by the Bay”. I visited “Satay by the Bay” two years ago (see the related article), and I will have dinner here this time again. There were a variety of stalls that covered most of Singapore local food, and I decided to have Satay at “KAMPONG SATAY”. Here is my dinner with 10 sticks of satay. While I returned from “Satay by the Bay” to watch the light-up of “Supertree Grove” two years ago, I will go east further this time. After a while, I reached “Marina Barrage”. 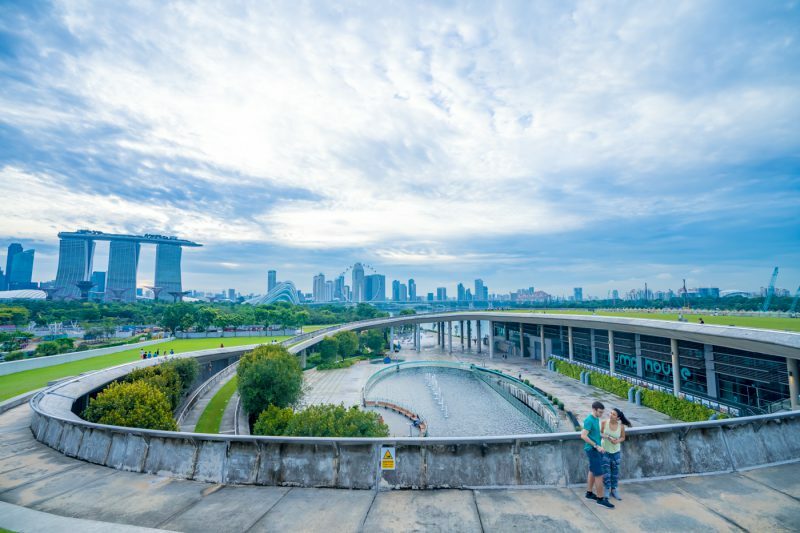 Marina Barrage was opened in 2008 as Singapore’s fifteenth reservoir and brings about three benefits: (1) Water Supply (2) Flood Control (3) Lifestyle Attraction. In particular, the third objective differentiates Marina Barrage from other reservoirs. As Marina Barrage sets “Lifestyle Attraction” as one of its main objectives, natural landscapes were beautiful. In addition to natural landscapes, its architectures were attractive. From the left side with the wide-angle lens. It was something like a circular art work, wasn’t it? I saw lots of visitors who came here by bicycle. Signboard also matched with background. There was a viewing spot called “Viewing Pod”. Since “Marina Barrage” faced Marina Bay, I saw tankers over there. With the sky main objective. There was a rooftop observation deck, so I will visit it. To move to the observation deck, I circled along a sloping path. I was not bored at all, as I enjoyed beautiful scenery including Marina Bay Sands. Now an incident occurred. The couple who appeared in the above picture started to argue and then the woman left the venue by herself. The man was at a loss. I waited for him to move so that I could take photos without including any people, but he continued to stay here, so I gave up my idea. I left the observation deck and went down. It was a beautiful curve line, wasn’t it? I saw several people who climbed up with roller blade or roller skate. Visitors were able to move the opposite shore by “Marina Bridge”. View from the bridge with Marina Bay Sands and Singapore Flyer. There was “Bay East Garden” on the opposite shore. I would like to spend more time to go around “Bay East Garden” if possible, but I will return due to my tight schedule. When I crossed the bridge to return, I found the water reflected like a mirror. I will kill time to wait for sunset and take evening photos. I liked this spot, so I took several photos around here. Then, I started to take evening photos, but due to the volume of this article, I will write about it in the next article. That’s it for the article about Marina Barrage as part of Day 4. In the next article, I will write about evening scene in Marina Barrage and Gardens by the Bay as part of Day 4.